LBJ Lady Bird Johnson: Love letters from their whirlwind courtship. Lyndon Baines Johnson and Claudia Alta “Lady Bird” Taylor conducted their courtship at breakneck speed. They met in Texas in September 1934 and were engaged by November. The pair was married on Nov. 17, 1934, and remained together until LBJ’s death parted them in 1973. Have been intending to tell you everyday about a little orange comb I carry in my billfold. It is the only thing I have from my little girl at Karnack and when I get lonesome and blue or happy and ambitious I always get pleasure when I look at the little comb and think …just think. The LBJ Library has just opened a new Web exhibit where you can read more courtship letters between the two Texans. Scroll down past the letter images to see a transcript. Thanks to Liza Talbot of the LBJ Presidential Library and Museum. 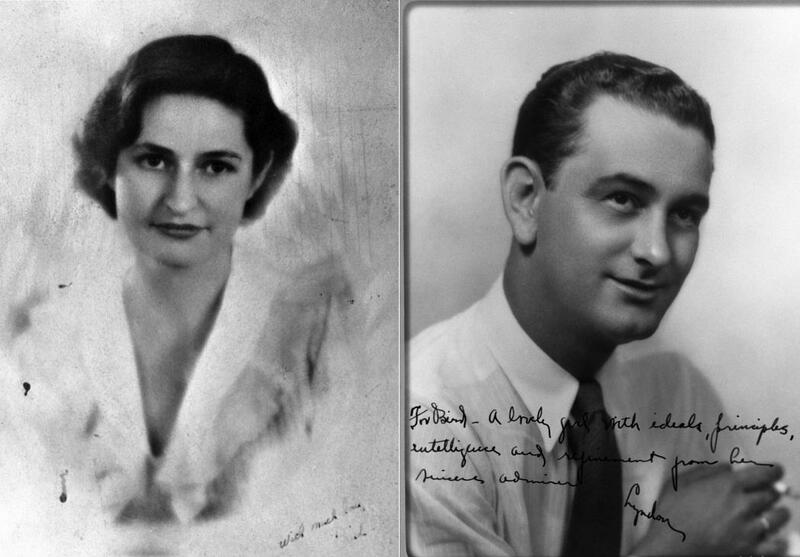 Headshots that LBJ and Lady Bird enclosed in their letters. His inscription reads: “For Bird: A lovely girl with ideals, principles, intelligence and refinement from her sincere[?] admirer, Lyndon.” Hers, simply: “With much love, Bird.” LBJ Presidential Library and Museum. Letter, Lady Bird Taylor to Lyndon Johnson, November 8 or 9, 1934?. From the personal papers of Lyndon and Lady Bird Johnson, LBJ Presidential Library and Museum. I wish I could put all the warmth and love into those words I feel. It was good to hear your voice–its so strong and re-assuring and vital, darling. When I got home I showed Dad my ring and last night we had a long talk about us. He was very sorry you left so soon–but I told him how it was. He was afraid you found our house too rough and inconvenient–which it is, what with no nice bath room and no attractive furnishings (–all that was our plan for me to do this winter.) Dad said he would have liked to talk to you some more. He thinks you are fine, Lyndon. He said, “He looks perfect physically and that counts a lot, honey.” (Fancy his having thought of that!) And he thinks you are going far, and that you love me, and that you’ll be good to me. But even he is a little grave about it being so soon. Darling, darling the reason I talk and act the way I do is because everybody is so constantly urging me to “wait two or three months,” “wait-wait,” “two months isn’t long enough to have known the man you’re to marry,” “if he loves you he’ll wait for you”–and so on until my head aches. By all these “everybody” I mean Dorris and Cousin Trenna Mae and Aunt Effie (I’ve already talked to her by phone) and all the people who’ve known me since I was born and loved me so much. O my dearest, please don’t blame them–they can’t help it. It Its [sic] only because they love me and they want to be very deliberate about it. Do you hate me for being not entirely un-moved by them? Don’t – Lyndon, please.